Preheat oven to 350 degrees Fahrenheit. Grease 2 bread loaf pans. In a mixing bowl, mix together the dry ingredients. In a separate bowl combine the eggs, brown sugar, white sugar, and oil. Add the dry ingredients slowly to the egg mixture. When thoroughly mixed, add the sour cream and vanilla. Finally, mix in the shredded zucchini. Pour the mixture into the two loaf pans. Bake for 1 hour and 10 to 1 hour and 20 minutes (use a toothpick to see if the bread is done, it should come out clean, or with just a few crumbs on it. Enjoy! I am not sure why I have never made this, because I love it when I have a piece at my in-laws...this recipe might be the start of my baking it! LOL about the applesauce. You are too funny for admitting what has happened to all of us at one time or another! 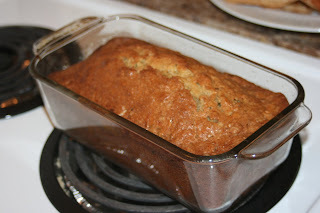 Yumm, zucchini bread. I like the addition of the whole wheat flour and the sour cream. Will have to keep this one. i love this bread. i would never think to use sour cream. it looks delicious! Such a great way to eat zucchini! Why do we do that to our poor applesauce!! LOL!! I've done it more times than I like to remember! This bread sounds wonderful, love the addition of sour cream! OMG, how good would this be slathered with cream cheese? !